Researchers have found that a vast array of regularly spaced, still-inhabited termite mounds in northeastern Brazil--covering an area the size of Great Britain -- are up to about 4,000 years old. This image shows mound fields. The mounds are found in dense, low, dry forest caatinga vegetation and can be seen when the land is cleared for pasture. 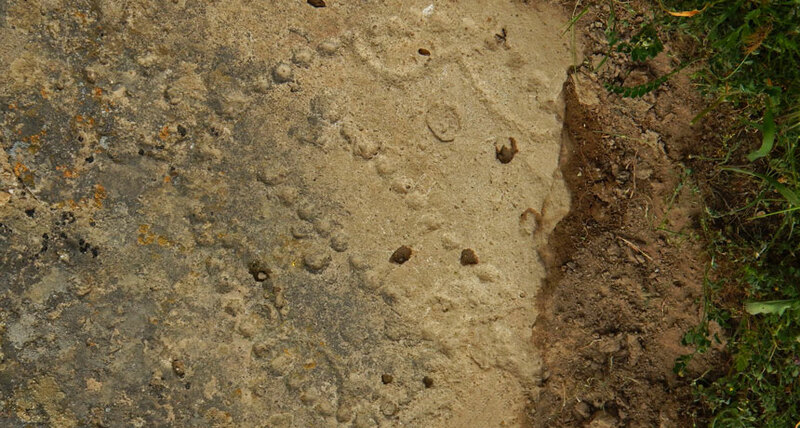 Researchers reporting in Current Biology on November 19 have found that a vast array of regularly spaced, still-inhabited termite mounds in northeastern Brazil -- covering an area the size of Great Britain -- are up to about 4,000 years old. The mounds, which are easily visible on Google Earth, are not nests. Rather, they are the result of the insects' slow and steady excavation of a network of interconnected underground tunnels. The termites' activities over thousands of years has resulted in huge quantities of soil deposited in approximately 200 million cone-shaped mounds, each about 2.5 meters tall and 9 meters across. "These mounds were formed by a single termite species that excavated a massive network of tunnels to allow them to access dead leaves to eat safely and directly from the forest floor," says Stephen Martin of the University of Salford in the UK. "The amount of soil excavated is over 10 cubic kilometers, equivalent to 4,000 great pyramids of Giza, and represents one of the biggest structures built by a single insect species." "This is apparently the world's most extensive bioengineering effort by a single insect species," adds Roy Funch of Universidade Estadual de Feira de Santana in Brazil. "Perhaps most exciting of all -- the mounds are extremely old -- up to 4,000 years, similar to the ages of the pyramids." The mounds are largely hidden from view in the fully deciduous, semiarid, thorny-scrub caatinga forests unique to northeastern Brazil. They'd only really come into view by "outsiders," including scientists, when some of the lands were cleared for pasture in recent decades. Soil samples collected from the centers of 11 mounds and dated indicated that the mounds were filled 690 to 3,820 years ago. That makes them about as old as the world's oldest known termite mounds in Africa. The researchers investigated whether the strangely regular spatial pattern of the mounds was driven by competition amongst termites in neighboring mounds. Their behavioral tests found little aggression at the mound level. That's compared to obvious aggression amongst termites collected at greater distances from one another. The findings lead the researchers to suggest that the over-dispersed spatial mound pattern isn't generated by aggressive interactions. Instead, Martin and his colleagues propose that the mound pattern arose through self-organizational processes facilitated by the increased connectivity of the tunnel network and driven by episodic leaf-fall in the dry forest. They say that a pheromone map might allow the termites to minimize their travel time from any location in the colony to the nearest waste mound. The vast tunnel network apparently allows safe access to a sporadic food supply, similar to what's been seen in naked mole-rats, which also live in arid regions and construct very extensive burrow networks to obtain food, the researchers report. "It's incredible that, in this day and age, you can find an 'unknown' biological wonder of this sheer size and age still existing, with the occupants still present," Martin says. The researchers say there are many questions still to pursue. For instance, no one knows how these termite colonies are physically structured because a queen chamber of the species has never been found. This research was supported by RRF was supported by FAPESB and CNPq.